Our university is situated in one of the most vibrant cities in the Southeast. 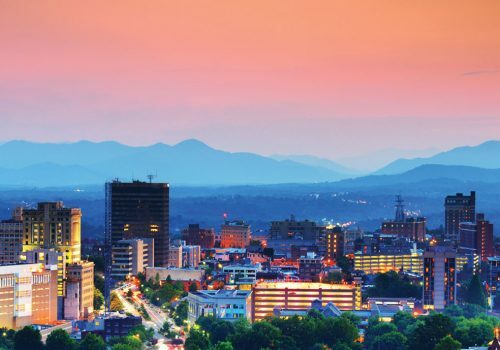 With a population of 87,000 in the city and 391,000 in nearby metro areas, Asheville offers an inviting downtown, exciting outdoor adventures, a thriving arts community and an array of eclectic dining opportunities. There’s always plenty to do in Asheville. Interested in paddling down the French Broad River or taking in a game at the minor league stadium? Or maybe a drum circle and political rally are more your scene? Why not catch a touring concert at the Orange Peel, ranked as one of the top five entertainment venues in the nation by Rolling Stone Magazine? Asheville is well-known for its assortment of historic architectural styles, including the nation’s largest private residence, the glamorous Biltmore Estate. Find out more about the endless possibilities by visiting the Asheville Area Chamber of Commerce or the Asheville Convention & Visitors Bureau, and discover how Asheville serves as a hub for business innovation, medical developments, technology, and creativity by visiting the Economic Development Coalition for Asheville-Buncombe County. Food is a big deal in Asheville. Restaurants offer everything from down home Southern fare to gourmet vegetarian dishes served in cozy pubs or sidewalk cafes, many with live music. The city is nationally known as a craft brewing community, for those over age 21, and Buncombe County is home to more than 20 commercial breweries. A host of farmers’ markets (including one right on campus!) offer fresh, local produce and prepared foods. If this sounds like a gourmand’s delight, you’re right. Asheville has been dubbed “Foodtopia,” where really great food and drink reign supreme! Check out dining options listed on the Asheville Area Chamber of Commerce website. One UNC Asheville alumnus created his own tongue-in-cheek city motto: “Come for the protests, stay for the shopping.” While it’s true that some residents are politically active, everyone is swayed by the range of shopping opportunities. You’ll find traditional Appalachian pottery and other crafts in galleries and shops, handmade dog biscuits and haute couture – all in one city block! Around the corner, you’ll find bookstores that cater to those who seek hard-to-find reading selections. Another downtown shop features nationally acclaimed chocolate truffles. Check out shopping choices on the Asheville Area Chamber of Commerce website. The following hotels offer discounts for UNC Asheville guests and visitors. Rates will vary based on season, and reservations are based on availability. A portion of the proceeds from your stay will be donated to UNC Asheville. Please ask for the UNC Asheville Friends and Family Rate when making your reservation.